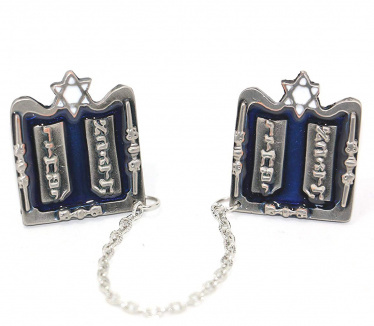 Silver Plated Tallit Clips with White Enameled Jewish Star Ten Commandments. Strong clasp ensures clips will stay on Tallit. The perfect gift for Bar Mitzvah or to go with any Tallis selection. Each side of the clip measures 1.25" x 1.5".